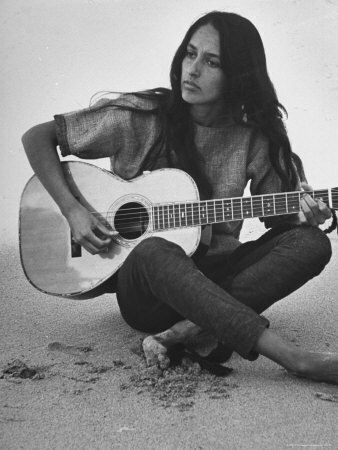 Joan Chandos Baez (born January 9, 1941) is an American folk singer, songwriter and activist. Baez has a distinctive vocal style, with a strong vibrato, and her recordings have included topical songs and material dealing with social issues. She is well known for her hit "Diamonds & Rust" and her covers of Phil Ochs's "There but for Fortune" and The Band's "The Night They Drove Old Dixie Down" (a top-five single on the United States charts in 1971). Other songs associated with Baez include "Farewell, Angelina" and "Love Is Just a Four-Letter Word" � along with "Joe Hill", "Sweet Sir Galahad" and "We Shall Overcome" (three of the songs she performed at the 1969 Woodstock Festival). She helped to bring the songs of Bob Dylan to national prominence, and has displayed a lifelong commitment to political and social activism in the fields of nonviolence, civil and human rights and the environment.